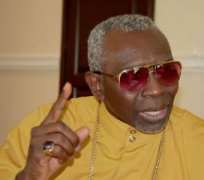 The President of CAN, Pastor Ayo Oritsejafor, in a statement issued on Saturday in Abuja which was obtained by our correspondent, said it was unfortunate that while some Nigerians were making efforts towards entrenching peace, others were indulging in drawing the road map to further destruction of our country. “The entire Christian community in Nigeria received the news of the latest in the series of bomb explosions, this time around at the mosque near the Emir's palace in Kano, with shock and disbelief. 'This is most unfortunate given the number of people that lost their lives in their bid to offer prayers to their Almighty in the usual Friday worship at the mosque. 'This attack on the people of Kano is an attack on all Nigerians and must be addressed as such. This is the time for all to rise up and act. May God help us all, as we make this strong effort at curbing terrorism in our land,” he stated.